Hello. 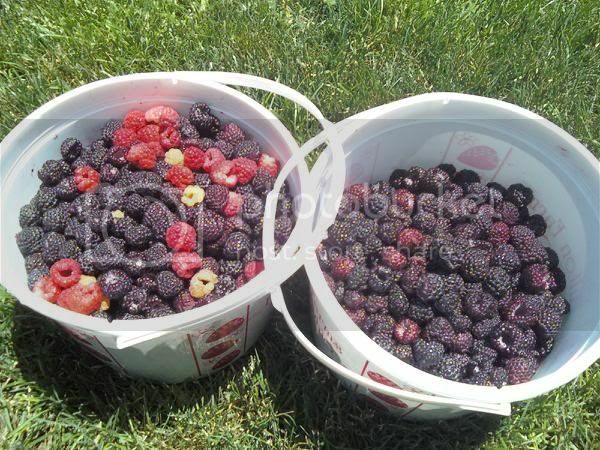 So I have wanted to grow rasberries for a while now. I don't really have anywhere in my yard for them though. I was wondering how much I would get if I planted like 4 bushes in a big half wine barrel. Or would this be to much? My blueberries were in containers until I planted them this summer. They took off sending up new canes. If I plant some rasberries in with my blues will they take over? My blues are more important at this point. All brambles need their own area as they will really, really take over.. you can train them on wire fences but you will still have to dig out their prolific suckers. If you planted them in with the blueberries you would never get to the blues.. I agree. My espalier pear is being threatened by the raspberries wanting to push out of bounds. I have some room for them to expand on the other side, but they seem to want to migrate downslope more than upslope. They've already decided to double their territory to the other side of the fence. Also, I think the blueberries would be happier in more acid soil than the rasps. I keep mine in rows and trim back what trys to walk out each year They do pretty good. The blues do have more acidic soil but the rasberries would still be in the same bed just in a different spot. I guess that is out of the question. My blues have an awesome little microclimate that they do amazing in because it stays cooler. WOuld my rasberries be ok in full blazing sun? How many bushes would I need to get 1 of those little tubs that stores sell them in every week during harvest time? review the pics of Ohio tiller and take notice of how prolific those canes are compared to the area they are in..if you plant your berries in tubs I am thinking you will need a ladder to harvest them and the root system will suffer..as far as being in full, blazing sun, remember the sun shifts so they wont be in it the entire length of a day..not saying you cant grow them in tubs so give it a try..trial and error..see what happens. I don't know how many you would need, but there are different cultivars that fruit early, mid, and late season, as well as cultivars that primarily fruit in summer with or without a smaller crop in fall and varieties that are grown mostly for the fall crop. 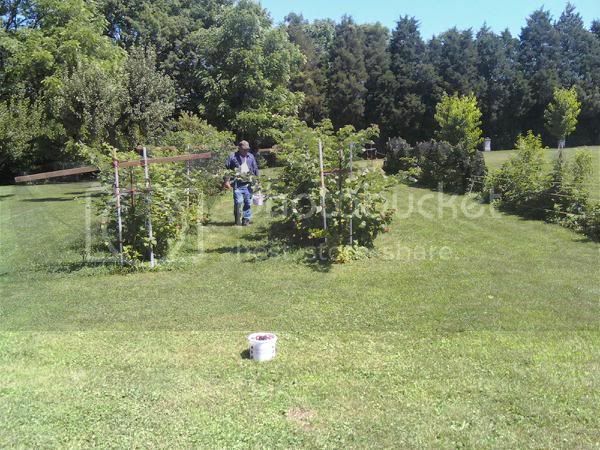 My blueberries fruit 2 huge crops in spring and fall the spring crop being slightly larger. The fall flowers are just starting to ripen. I usually harvest daily but Ill be gone for a week when they are ripening so I will have a ton to harvest when I get back. Yum! They are fairly small berries though. I cant seem to get big ones. They are significantly smaller than store bought ones and the variety I have (misty is what it is) is supposed to be a medium to large fruited variety. Do you think I should give it more fertilizer? I will order a soil test kit to see how acidic it is. I think that the soil is around 7.0 but I am not sure. I will add sulfur or whatever it needs once I figure it out.